Fully revised and updated, this book combines a theoretical background with examples and references to R, MINITAB and JMP, enabling practitioners to find state-of-the-art material on both foundation and implementation tools to support their work. Topics addressed include computer-intensive data analysis, acceptance sampling, univariate and multivariate statistical process control, design of experiments, quality by design, and reliability using classical and Bayesian methods. The book can be used for workshops or courses on acceptance sampling, statistical process control, design of experiments, and reliability. Graduate and post-graduate students in the areas of statistical quality and engineering, as well as industrial statisticians, researchers and practitioners in these fields will all benefit from the comprehensive combination of theoretical and practical information provided in this single volume. Combines a practical approach with theoretical foundations and computational support. Provides examples in R using a dedicated package called MISTAT, and also refers to MINITAB and JMP. Includes exercises at the end of each chapter to aid learning and test knowledge. Provides over 40 data sets representing real-life case studies. 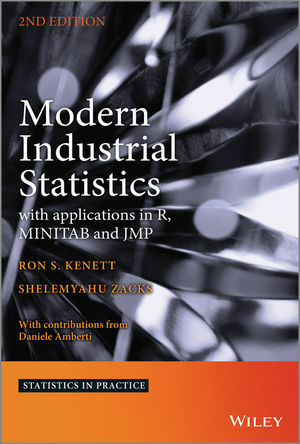 Is complemented by a comprehensive website providing an introduction to R, and installations of JMP scripts and MINITAB macros, including effective tutorials with introductory material: www.wiley.com/go/modern_industrial_statistics. Comprehensive R Archive Network (CRAN) Website.